Harry Potter and the half-dead bint. Is there life, you know, after? Two British institutions – the revamped Hammer studios and Hogwarts alumnus Daniel Radcliffe – certainly hope so. Forging ahead with an adaptation of Susan Hill’s 1983 ghost story, best known as a West End fixture since 1989, it certainly seems to be the case. 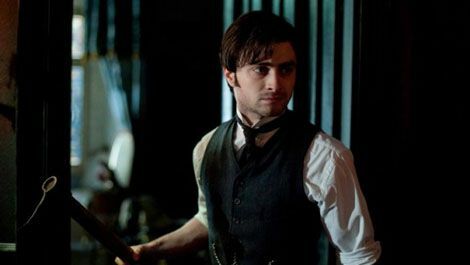 Under the guidance of Eden Lake writer/ director James Watkins, Radcliffe, who’s always had the look of a provincial office junior, plays Victorian solicitor Arthur Kipps. leaving his young son behind in London, Kipps heads north to the village of Crythin gifford to sort the affairs of the late Mrs Drablow, the sole resident of Eel Marsh House – or so it would seem. In the village, he encounters Royston Vasey levels of hostility (“if it’s a holiday you’re after, you’re better off going inland… there’s a lot of sea mists!” warns the innkeeper). on Drablow’s deserted island, cut off from the mainland by the treacherous (and misleadingly named) Nine Lives Causeway, he encounters something far worse. From London’s smoggy backstreets to the low-tide scum of the causeway, Watkins conjures an atmosphere of tangible unease, sometimes a little too tangible – chez Drablow may be one of the most haunted houses committed to celluloid. Stranded there over night, Kipps encounters a veritable tick list of supernatural signifiers, from wind-up toys that start by themselves to pallid faces at the window. Sometimes we glimpse the eponymous spectre even when he doesn’t, alerting us to the fact that this is an unrepentant fright flick rather than the character study suggested by Kipps’ tragic, if somewhat perfunctory, backstory. In places, it’s extremely effective – the woman haunts the island with the tenacity of J-horror’s more belligerent spooks, and she’s genuinely scary. Radcliffe, meanwhile, is terrific, exhibiting the greasy pallor of a haunted man. There’s some strong support from concerned local Ciarán Hinds (Dumbledore’s brother in Deathly Hallows Part 2 ) and a great sequence that sees Kipps submerge himself in the black mud of the causeway. Gillyweed would definitely be an advantage. The ending may be somewhat cheesy, but, for the most part, Watkins and scriptwriter Jane Goldman ( X-Men: First Class ) render familiar material enjoyably, efficiently eerie. As for that after life, both star and studio can rest easy – even if no one else can.